Camping next to Kilauea, one of the world’s most active volcanoes? Well, maybe not next to, but within Hawaii Volcanoes National Park where Kilauea is located. 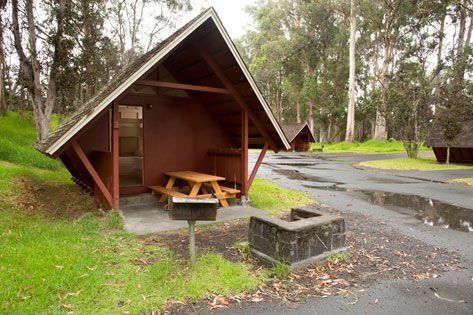 The Volcano House Cabins on the Big Island of Hawaii have been recently refurbished and offer a unique camping experience. These cute A-frame camper cabins are basic accommodations with a double bed plus a set of bunk beds with bedding and linens included. Just outside your door is a picnic table, BBQ and fire pit. Best of all, you are in Hawaii Volcanoes National Park, a World Heritage Site with two active volcanoes, Kilauea and Mauna Loa (the world’s most massive subaerial volcano) and the glow of Halemaʻumaʻu crater.